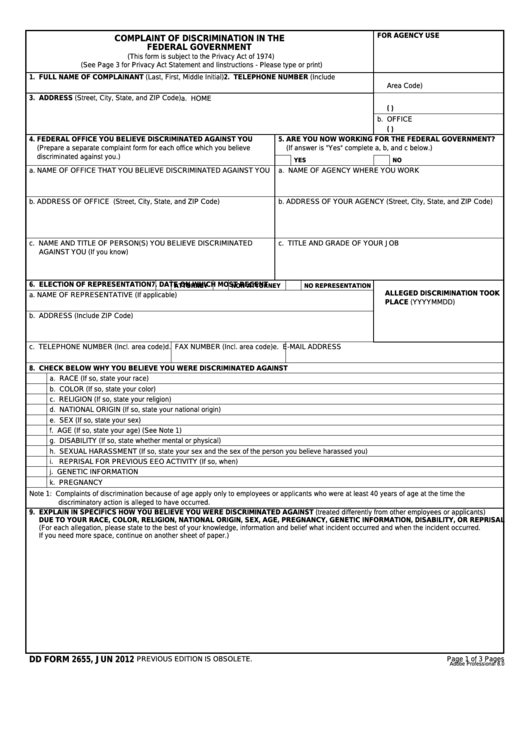 Download a blank fillable Dd Form 2655 - Complaint Of Discrimination In The Federal Government in PDF format just by clicking the "DOWNLOAD PDF" button. Complete Dd Form 2655 - Complaint Of Discrimination In The Federal Government with your personal data - all interactive fields are highlighted in places where you should type, access drop-down lists or select multiple-choice options. 5. ARE YOU NOW WORKING FOR THE FEDERAL GOVERNMENT? discriminatory action is alleged to have occurred. (For each allegation, please state to the best of your knowledge, information and belief what incident occurred and when the incident occurred.